The German Salmon fillet on zucchini and tomatoes is a great dish for the Good Friday menu or for any festive occasion. Great for a candle light dinner! This recipe is easy to make and takes only 15 minutes of your time. You can extend it easily if you have more guests than four. The zucchini-tomato mix is an excellent side dish for the salmon and tastes the best with boiled potatoes. Happy Cooking! - Rinse salmon under cold water and pat it dry; remove any visible bones with tweezers. - Drip lemon juice over each slice - spice with salt and pepper; cover and keep cool. - Wash zucchini, remove ends, cut in 4 parts, then in cubes. - Boil some water and place tomatoes for 1/2 minute into hot water, so you can peel them. - Cut peeled tomatoes in 4 parts, remove seeds and hard parts. Cut in cubes. - Heat half of the oil in a skillet. Add zucchinis, fry them briefly. - Press garlic through a garlic press (or chop it finely), add to zucchini, reduce heat. - Add tomatoes, salt, pepper and chopped thyme. Saute for about 10 minutes. - Heat remaining oil in a non-stick skillet, add salmon fillets, reduce heat a bit and fry them on each side for about 3-4 minutes. - Turn them carefully so they won't fall apart. - If needed add more salt or pepper to the vegetable. 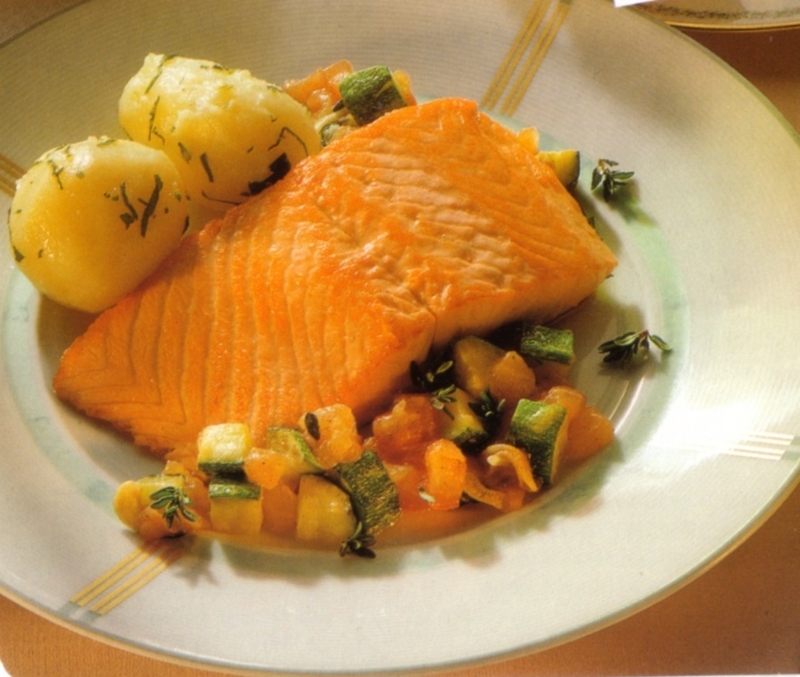 - Serve each fillet with the vegetable mix and boiled potatoes on warm plates . Peel potatoes, cut in half or if the potatoes are small don't cut them, boil in salt water until done; drain well and sprinkle with chopped parsley.